It’s August, which to a layperson simply suggests the dog days of summer. 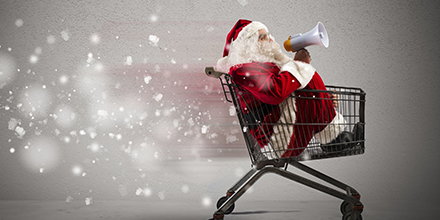 To those of us who do retail marketing, however, this time of year means expert advice and pontification, prognostication, declaration and occasional shaming. But, fear not; this blog contains none of the aforementioned. Rather, I’m here to tell you not to freak out. In fact, you’ll be OK! It’s the holidays. They’ve happened before, and they’ll happen again. The most important thing to do is just to be present. What do I mean by “holiday presence?” There are five ways to make your presence known this holiday season, and I bet you’re already doing some of them. Let me explain. Today’s consumer has been weaned on a steady diet of personalized presence over the past 3-4 years. More and more of the communications they’re exposed to on a daily basis contain a significant amount of personalization—personalization has virtually enabled one-to-one marketing in the digital age. So, companies and brands that regularly personalize your content—congratulations, you’re doing it right and making it happen. For anyone that hasn’t instituted first name personalization, at a minimum, in their newsletters and offers, it’s time to get cracking. Anonymous, impersonal content doesn’t engender the comfort, credibility, or trust that comes from familiarity. The Internet is not faceless and nameless. Banks have been using first and last name personalization for years to help combat fraud and phishing that often uses greetings such as “Dear Customer.” If the financial sector can inject that basic touchstone of familiarity and authenticity, then retailers that stake so much of their success on the last quarter of the year should be doing it too. If you take a gander at your inbox when you wake, you’ll see a bevy of messages that arrived during the middle of the night. With one under-caffeinated glance, you’ll make swift work of these missives by left-swiping them into oblivion. The problem with being first into the inbox is that you’re last to be seen, and more likely first to be deleted or archived. The steady drumbeat of human patterns have made checking email less of an event and more of a continuous act, like breathing or eating, or continuous snacking. There are points through the day when checking messages reaches a fever pitch: commute on public transportation, lunch, the afternoon slump, and the commute home. Make sure that your presence is felt during the day instead of racing to the inbox during the middle of the night when there’s no surprise to your arrival, no lovely “you’ve got mail” ring tone to usher in your presence. Our inbox presence hinges on understanding when you’re invited to the party, and when you should be at the table. The holidays are not necessarily the time to experiment with your templates; your A/B tests probably should’ve been done well before the fall. In a recent blog post on the Only Influencers site, Ryan Phelan, VP Of Marketing at Adestra, gives some solid advice about maintaining a well-tested, “emergency” template to pull out when a Johnny-Come-Lately needs an email to go out stat! This is solid advice, but let’s take it a step further—your presence needs to be consistent across the inbox, the landing page, the app, the push, the SMS and any other digital messaging channel that you or your customers employ to communicate and transact. Don’t do one-offs! Consistency is crucial given that email is a jumping off point to a number of different experiences that may include app-based commerce, mobile web, browser on a desktop, etc. This multitude of conversion options and possibilities is a boon for marketers that hope to engage with a broader range of customers empowered with the ability to chose their preferred platform—it also increases the complexity and need for greater stability and uniformity. Mobile is no longer the future, mobile is the present in which our inbox presence must be optimized for numerous mobile platforms and easily transferable to larger laptops and desktops. A few days ago, I listened to an episode of public radio’s “Marketplace” program. The host was discussing the fact that over 60% of U.S. adults now own smartphones. We’ve reached not only the mobile email consumption tipping point when more than half of all email is opened on a mobile device, but we’re very possibly at the device saturation point, as well. So what’s the next boundary and hurdle? Your presence as a marketer might soon be felt in the most intimate of ways: wearables. Mobile is not only in our pocket, it’s now on our wrists; wearables track our activities and provide a wealth of data that further help refine the one-to-one experience. But as I said, don’t freak out! Wearables are still early in their evolution, so have some fun, create segments, think even smaller and more refined than the mobile handset. In fact, SparkPost’s own Todd Herr recently shared some great advice for optimizing email for the Apple Watch. Anything other than playful experiments may be too much for this holiday season, but this is only one of many holidays to come! This will come as a no-brainer to you, but whatever you do, don’t be boring. This is not to say that you should make your subject lines and calls-to-action salacious. Your tone should reflect your brand and the spirit of the holidays, but do give yourself the freedom to be creative, to experiment, to not be afraid to have some of those experiments fall flat on their face. Have fun with holidays—the world is an ever-changing place and being present is the only absolute rule to follow.